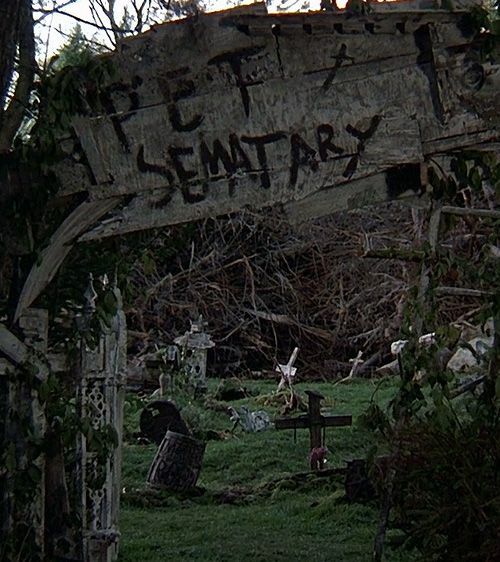 The Pet Sematary by the original Creed house!! The original Creed house that is now remodeled in my version. The house the Hetfield family moves into. “Hey Mom; look the house!” said eight-year-old Billy Hetfield as she pointed out of the window at the huge one-story white house with the big spacious porch and lots of windows. “Yeah Honey; isn’t it gorgeous?” said her Mother Cindy Hetfield from the driver’s seat of her SUV. 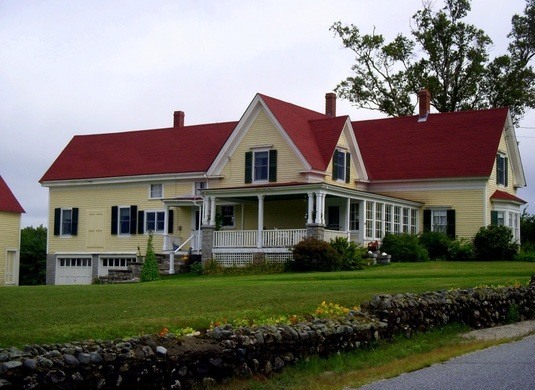 The SUV slowly turned a corner and drove into the driveway of the unique looking 18th century home. As she drove into the driveway, she saw a car parked in front and a woman standing close to it holding what seemed to be a chart. “That must be the realtor sweetie,” said Cindy as she stopped her car behind the black Toyota Camry. She could hear her daughter getting more and more excited in the backseat. Cindy opened her car door and stepped out. The realtor walked up to her and smiled at her with welcoming grace. “Welcome, Mrs. Hetfield….” Said the realtor as she extended her hand out for a handshake. “It’s Miss Hetfield,” said Cindy. “My husband just died about two months ago, so I’m a window now,” said Cindy as she shook the woman’s hand. “My apologies,” said the realtor. Just then Billy opened the back-seat car door and stepped out. Her black golden retriever jumped his way out after her. The old dog ran around the yard as Billy made her way around the car to her Mother’s side. “This is my daughter Billy. She has been looking forward to our new house for a while now,” said Cindy as she pulled her daughter against her side. The realtor looked down at Billy and smiled. The little girl was a beauty with gorgeous golden blond hair down her back, piercing big baby blue eyes and nice pink heart-shaped lips like her Mother. She was the spinning image of her Mother; despite her Mother's high cheekbones and thicker suckle lips. “Well, I hope you love your new home, Billy. I am sure your mom will too,” she said. “If you will follow me inside.” She gestured for them to follow her. Cindy and her daughter walked behind the realtor towards the front porch. She heard Billy calling out to her dog. “Max…. come on Max, it’s time to go inside,” yelled Billy to her dog which was now making its way to her. When they got to the front door, the realtor reached into her back pocket and brought out a little gold key. She used the key to open the front door. The family of two along with the realtor made their way into the front foyer of the house. “As you already know the house was built in the 1700’s. It is fully furnished. It was just recently remodeled into a more modern style. The tiles on the floor are new along with the marble floor and utensils in the kitchen,” said the Realtor as she showed them around the living room and kitchen. “For the re-modeling of this house, the price is pretty cheap,” said the realtor. They stopped at the kitchen. “Yeah, why so cheap? It seems like it would cost so much more, because of all this new and up to date stuff,” said Cindy as she looked at the high-tech gas stove and marblewood cabinets. “Oh, this house has some history,” said the Realtor. Cindy opened a cabinet and peered inside. “What sort of history?” asked Cindy. She looked back at the realtor. “I hope nobody died,” said Cindy. She shut the cabinet door. “Oh, no! Nothing like that, I hope,” said the realtor. The realtor handed her the gold key. “Well, I think you have already seen everything about the house from our videos and pictures I sent to you a month ago. I hope you enjoy your new home and if any other questions come up, please don’t hesitate to call me.” She reached into her purse and brought out a business card, handing it to Cindy. Cindy took it and stared at the black ink engraved on the front. It read “Stephen and Corp Realtors.” Below the name was a couple of names and phone numbers. “Umm… which number is yours?” asked Cindy. The realtor pointed to a number beside a name that read Amy Sanders. “That’s my name and number. Feel free to call at any time during the day,” she said. Cindy walked the realtor to her car. “Well see you later,” said the realtor right before she got into her car. “Goodbye Amy,” said Cindy. Cindy watched the realtor get into her car and pull out of the driveway. After she was gone, Cindy decided to bring all the boxes of belongings into the house. She was going to place them in the foyer. ; later, she would unpack them and put her and her daughter’s things up. As Cindy brought the boxes of belongings into the house, Max ran his way out of the open front door with Billy running after him. “Honey, it’s getting late. “You can stay out and play with Max for a little bit longer, but you have to come in soon,” said Cindy as Max and Billy ran by her. She picked up the last box from the trunk of the car and gently adjusted the heavy box in her hand and carried it inside the house. She slowly set the box down amongst the other boxes that were recently placed in the foyer. Cindy heard Max barking outside. She decided to take a look and see what was going on. She walked over to the open-door way and looked out at her daughter who was holding Max on his leech across the yard, while he was barking and trying to get free from her hold. The dog seemed to be barking at a secret path along the side of their driveway. Cindy could not tell exactly where the path led too, but her dog was really disturbed by it. “Hey Billy, what’s Max barking at?” asked Cindy as she made her way over to them. “I don’t know Mom. He is really getting all worked up on this path here. She frantically pulled the dog back by his leech. Max would not give up; he kept on barking and trying to break free. Cindy came up to them and grabbed Max’s leech from Billy’s hand. “Stop it, Max, stop it,” she yelled at the dog. She dog would not give up. She kneeled down beside the golden retriever and tried to calm him down. She rubbed the dog and patted at his ears in an attempt to calm him. After a few more rubs, Max finally calmed down. “Let’s go inside. I’ll order Pizza,” said Cindy. Cindy pulled at Max’s leech, making the dog let out a soft whimper. Both she and her daughter along with Max made their way across the front yard and into the house. When they got into the house, Cindy handed Billy the leech. She shut the door as Billy and Max raced down the hallway. Cindy walked back into the kitchen and grabbed her purse from the marble countertop. She reached inside to search for her phone. She finally pulled it out from the bottom. She dialed the pizza company number and ordered a large pepperoni pizza with a bottle of soda to go with it. After she was done, she decided to set the table. She walked back into the foyer and sorted through a couple of boxes. She finally brought out some plates and glasses out of a box that read fragile on the outside of it. With the glasses and plates in hand, she made her way back into the kitchen and prepared the kitchen table for her and her daughter’s evening meal. After she was done, she pulled out a chair and collapsed down on the cushioned seat. She sat there and quietly waited for the pizza man. Ten minutes later, the doorbell rang. Cindy got up and ran towards the door, but her daughter had already beat her to it. She walked behind her daughter who was already taking the pizza box from the delivery man and thanking him for delivering it. “Honey, why don’t you take the pizza to the kitchen, while I pay this nice young man?” Cindy asked her daughter. Billy obediently nodded and walked away with the pizza box and twelve liters of soda in hand. Cindy reached into her pocket and brought a couple of dollar bills, handing it to the nice stranger. He thanked her for the money and turned to leave. She shut the door and made her way back into the kitchen. When she got there, Billy already had her plate full of slices of pizza and was chewing on a slice. “You should wait for me Billy,” Cindy told her daughter while taking a slice of pizza from the box and placing it on her plate. Billy just mumbled a “Sorry” and bit on another slice with her mouth still full. Cindy lowered herself down on her own chair and ate with her daughter. “Billy, how do you like your new room?” asked Cindy. Billy looked up from her food. “It’s nice Mom….” She trailed off. Her face suddenly turned sad and she slowed her chewing in her mouth. I really wish Daddy was here with us.” She collapsed back in her chair and lowered her head down with sadness shown all over her appearance. Cindy could tell her daughter really missed her father. He had died in a tragic car accident two months ago. It was really tragic for her and her daughter when they heard of his passing. Billy cried for a month and locked herself up in her bedroom. She was deeply devastated. Cindy did not know what to do at the time. She had been devastated herself. The only way she knew how to grieve for her deceased husband was to slowly pull away from family and friends. She did not want to do anything or go anywhere for a month. One of Cindy’s husband’s family members had to talk to her. Her husband’s younger sister forced Cindy to stop her lazy attitude and start being a Mother as well as a Father to her daughter. Because Cindy was a stay at home Mother when her husband was alive, she found it difficult to find a job with her Pediatrician M.D Degree. But finally managed to find a job opportunity in The Main town of Ludlow; a few miles from where she lived. It was a self-practice and it was a promising opportunity for her, which gave her the opportunity to move there. In the weeks that followed, Cindy searched through the newspaper ads for decent available houses that were on the market in Main. She finally found one and contacted the realtors. The realtors told her everything about the house and sent her videos through email. She loved the house and made it a done deal. A week later, she and her daughter were already packed and moving 3 miles east to the little town of Main. Billy let out a deep relieved sigh and lifted her head back up to continue her meal. After she was done, Cindy got up and took her daughters hand. She led Billy down the short narrow corridor and into her bedroom. Billy’s bedroom was very beautiful with mermaid drawings on the pink walls and a pink canopy bed in the corner. There was a nice little bedside table beside it and a small closet on the other side of the room. Cindy watched as he daughter got ready for bed. She got out of her clothes and put on her Spongebob SquarePants nightgown. Cindy tucked her daughter into bed. Before she shut off the bedside lamplight, she kissed her daughter goodnight. By this time, Cindy was feeling tired and sleepy as well. She knew she had to clear the table before heading to bed. She made her way make into the kitchen. She picked up the plates and cups from the kitchen table, placing them in the sink. She rinsed them off and placed them one by one inside the dishwashing machine. After she was done, she turned the dishwasher on. Finally heading to bed, Cindy picked up a box full of her clothes from the foyer tile flooring and made her way down the corridor and into her own bedroom. Inside her bedroom, she placed the box down on the floor and took off her clothes. She grabbed a two piece night set from the box and put it on. She finally cut off the light and jumped into bed. Snuggling under the covers, she quickly fell into a dreamful sleep. As Cindy slept, she kept seeing the many faces of the souls whose lives were taken by the burial ground beyond the pet cemetery. She saw the faces of Louis Creed, Rachel Creed, Gage Creed, Drew Gilbert, Gus Gilbert and Clyde Parker; the souls that the evil of the soiled earth beyond the Sematary took. Cindy seemed to be disturbed by their faces and was tossing and turning in bed. They seemed to be calling out to her, but she could not understand what they were saying. The voices kept chanting the words, “The barrier is not meant to be crossed. The ground is sour.” Those words were repeated over and over in her mind until the faces finally vanished, and the voices got fainter and further away; and then stopped. After the voices had subsided, Cindy could finally relax and drift off into a more peaceful and deeper slumber. LOL!! The path leads to the Pet sematary. The sematary holds evil. The dog can smell the evil in the air. I hope you stick around for me. Thanks girlie. Thank you Amy, I really appreciate your interest in this. I'll be posting chapter 2 very soon. Thank you story, I hope you continue to read on. Hey girl. I love some Stephen King so I had to check this. I saw the movie but I didn't read the book. I can't remember how they end up moving to that house in the original story, but I like the tragedy play you do here with the husband dying and forcing the wife to work. Looks like they move for her job opportunity. Although they like the house, even without the reader's knowing what's coming, you still get this desperate feeling. There's a sadness but more than that, just an uneasiness about the picture you paint. You do realize what you're doing with the dog barking at the path qualifies for literary foreshadowing. That's well done. This dream sequence is worrisome for sure. Okay thank you hun for reading and pointing out my mistakes. I will fix it now. I hope you can read the next chapter. Now I want pizza again. It's so sad to see Billy miss her father. Yesterday was the 6 year anniversary of my father's passing too. I had a dream of him being alive still, and us being in our old house last night, as I mentioned on the 'phone.....anyways just reading about the house gives me the creeps. I'm already scared! Than you hun, yes it does. Okay, thanks nitie. I hope i can!!! Great Beginning! I wonder if she's psychic to have though's dreams.I look forward to where your story takes us! No she is not a psychic. The spirits that the ancient Indian ground took are communicating to her through her dreams. They are warning her of the evil the burial ground receives.